The Lagotto Romagnolo does not smell bad and does not stink. A dog that lives a lot in the open air gets dirty more easily. The dirt accumulated on the mantle can give a bad odor but it is not typical of the dog. To be more explicit the Lagotto does not in itself have the classic hunting dog smell. 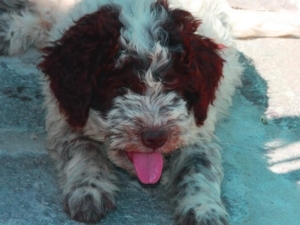 The Lagotto Romagnolo raises a lot of interest also as a dog from the apartment because it does not lose fur. Against the constant growth of the mantle and the tendency to felting requires a minimum of care in the management of the hair. An annual shearing in the spring period when temperatures tend to rise is advisable. The dog will be less heated with the arrival of the summer. The mantle of the Lagotto will not be the refuge of a thousand grasses during our excursions or walks to the gardens. The shearing is a sort of reset. You can manage the hot season better and get in order to the next autumn-winter. How many combing the fur of the Lagotto? Here’s one of the recurring questions. It doesn’t have to be a very frequent, daily practice. Once a week or even two, depending on the period and length of the mantle. A longer cloak should be cared for more frequently. which combs or brushes to use to treat the fur of the Lagotto? The carer is used when the hair is badly placed, inaccessible to a comb in thin-toothed steel. The carer wastes a little The shape of the hedgehog. The hedgehog will still tend to reform. The carer if used frequently and intensely can greatly spoil the mantle. At that point it is advisable to have a bath with a nice drying. The goal to have a nice hair is to be able to comb in the back of our little coat with the comb with sparse teeth. In summary: Long steel carer and comb with sparse teeth on one side and more dense on the other. How many do you wash the Lagotti Romagnoli? It depends on how dirty it is. In fact, or absurd the bathroom is not a practice required for the dog. Washing the Lagotto Romagnolo means using balms beyond the shampoo. The conditioner facilitates the operation to dissolve knots and detangle the felted hair. When the dog is quite dirty the only brushing and combing may not be enough. The bath becomes inevitable. A nice dry with the phone helps the hair to resume its beautiful characteristic shape: the Hedgehog. Good chance for a DIY snib. 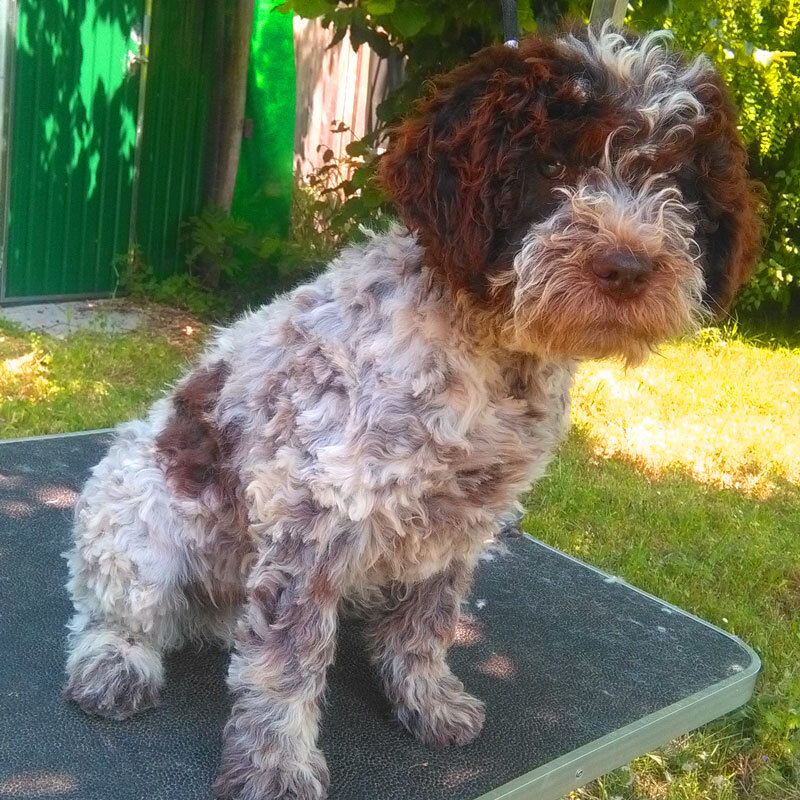 How to shorten the fur of the Lagotto Romagnolo? If we opted for a machine shearing, special electric shaver for dog, we will make a height of 3mm. We will discover another dog, with strengths and faults, certainly lovable and sweet. A grooming machine will do it well without problems and with professional equipment. If we want to shorten the mantle to scissors we will aim at a height of about 2 cm. The owners of the pet lagoons are not always allowed to go to a DIY hairstyle. Yet it is a feasible thing, in time it can give also satisfactions. The not yet high breed diffusion is the main reason why the Lagotto’s mantle is often shortened randomly by grooming shops. How to shorten the fur of Lagotto Romagnolo with scissors? 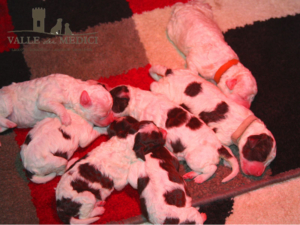 In This operation we will have to follow those that are the morphological characteristics of the breed described in the breed standard. The rustic look that the dog must keep helps to cover any scissor errors. In time we will certainly improve and often with satisfaction we manage to maintain a nice and orderly appearance of our Fido. Here are some tips. We will not be ready to go to an exhibition but we will certainly caress your dog joyfully. As a general rule the scissors are used on a mantle untated by knots and well cared for. Head: Trim the ears to give it a triangle shape. Do not shorten excessively over the nose and not even stop between the eyes. Give the head a round shape starting from the lower jaw to get to remove the hair in front of the eyes. Under the eyes the hedgehog must be combed down, above the eyes a round shape is privileged but never an excessive lowering. Standard Lagotto Romagnolo: The ideal Lagotto [/caption] Neck: keep it lower than the trunk going to exalt the shape of the shoulders and above that of the head. Clean well under the ears. Trunk: An almost constant height, slightly shorter on the hips, trying to enhance the shoulders and thigh. Clean the bottom well. Back area: Shorten the thigh back by recovering a little height on the end of the leg. Respect the same hair height even on the tail. Feet: Turn well around the foot for the fingertips to touch and no stray tugs! I got a little ventured into these explanations. I hope it’s appreciated the attempt! However, the images of the standard of breed of Lagotto Romagna help in trying to give some forms that at least come close to the idea of the Lagotto Romagna.